TSB's reputation will depend on how it compensates customers for the distress and inconvenience caused by its IT fiasco, an expert has said.Richard Lloyd, chairman of complaints service Resolver, said the bank would be "in big trouble" if its failed with customers' less tangible losses. A perfect illustration is the case of the Jones family - TSB mortgage-holders - who were expecting to move house.For 24 hours they faced the prospect of having to move to a hotel instead.The migration of data on TSB's five million customers from former owner Lloyds' IT system to a new one managed by Sabadell has led to nearly two weeks of difficulties for the bank and more than 40,000 customer complaints so far. Mother-of-two Sally Jones, 40, said their saga began with a concerned call from their solicitor on Wednesday afternoon - the day before the family were expecting to move to their new home in south London.The solicitor explained that, for no apparent reason, a new account number could not be uploaded on to TSB's new IT system, so funds might not be released for their house purchase.At exactly the same time, TSB chief executive Paul Pester was telling MPs that the "underlying engine" of the bank was working well.A sleepless night followed, before the removals van arrived early on Thursday, and their belongings were loaded up. Their daughters - Hannah, six, and Sophie, three - were despatched to school and nursery. Then, their moving day stress became even more acute. "The TSB staff were being as helpful as possible, but they were hampered by the terrible IT mess. It was a ridiculous situation to be in. We were in limbo," she said.As the day went on they started to call hotels. Decorators were expecting to arrive the next day, and they removals company said the next available slot for delivering their belongings was after the bank holiday. First they sat outside their new home waiting for the money to come through. Then, powerless to do anything, the couple's wait continued in the pub. Eventually, with the clock ticking the call came through that the TSB computer had at last said "yes". They could finally pick up the keys and move into their new home.Mrs Jones said they would complain, but the extra stress will be difficult to quantify in terms of compensation. TSB has said that no customers will be left out of pocket, and it has called in accountancy firm Deloitte to devise a system of redress for customers. "I do not think that is going to make consumers feel particularly confident that they are going to be treated fairly," said Mr Lloyd, of Resolver.He said that they were no clear industry rules on what kind of compensation should be agreed for stress and inconvenience. "How TSB deals with this will be as important to their reputation in the future as the meltdown itself," he told Radio 4's Today programme. "If they do not deal with this less tangible loss properly and fairly then they will be in big trouble. 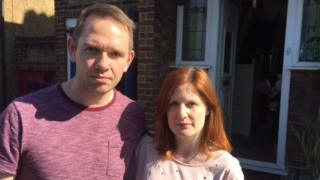 "He suggested that anyone affected should document what had happened, and consider taking a case to the financial ombudsman if they were unhappy with how TSB dealt with their complaint.TSB apologised and promised the couple would not be left out of pocket.A spokesperson said: "We're really sorry for the experience Mr and Mrs Jones have had whilst moving home and the inconvenience this has caused them. "This isn't the level of service that we pride ourselves on providing, and isn't what our customers have come to expect from TSB. We have reached out to Mr and Mrs Jones, and we will ensure that they are not left out of pocket."